The Verizon Center's booked for a hectic but promising stretch of high-profile concerts this weekend. 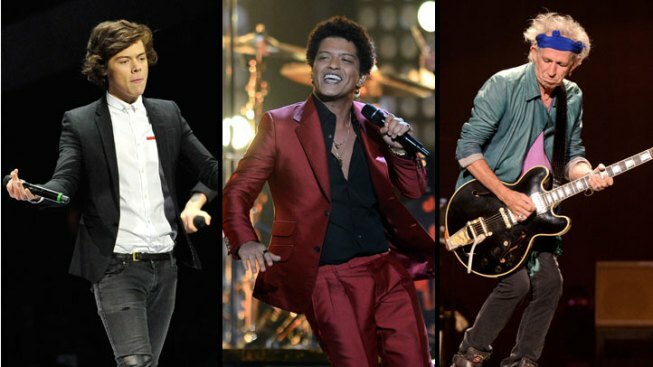 The festivities kick off Saturday when crooner Bruno Mars opens his worldwide Moonshine Jungle Tour in D.C. It will mark the first time that a tour has ever premiered at the Verizon Center. On Sunday, boy band One Direction will stop by on their Take Me Home tour. The lads of One Direction will also be mostly performing songs from their second album (which shares the tour name), though their recent set lists suggest there will be a lot of talking and tweeting between opportunities to make teenage girls swoon. The three-day stretch will be capped off Monday by a performance from legendary rockers The Rolling Stones on their 50 & Counting Tour. Yes, the "50" represents the half-century (and then some) that they've spent churning out hits like “Paint It Black” and “Jumpin’ Jack Flash.” Considering Katy Perry and Dave Grohl have joined them on stage already during this tour, we recommend you keep an eye out for suprise guests. There will be no rest for the weary, as the Verizon Centers hosts a WNBA matchup between the Washington Mystics and Phoenix Mercury on Thursday.